Any behaviour change usually occurs as a result of a compelling cause. Either, our current circumstances become so unbearable that we need to move away, or the destination we want to get to becomes irresistibly compelling. More often than not, change occurs out of a combination of both. Usually a serious health scare will present a compelling reason to make lifestyle changes, often providing a frightening wake-up call towards healthier goals or facing the alternative. If we haven’t reached the point of a serious health scare yet, compelling information can present itself to reminding us we are better off making wise choices as well as giving us hope that we can attain that desired goal. Our hope is that Intentional Health will compel you to want to make changes before you ever need to! Intentional Health aims to give us all some food for thought in just how to do that - it aims to present some information that helps us realise we can make changes to behaviours, and provide support in sustaining those behaviours until they become habitual. We hope also reminding us that in today’s culture we need to be Intentional about our health and wellbeing to live a healthy, happy and productive life. 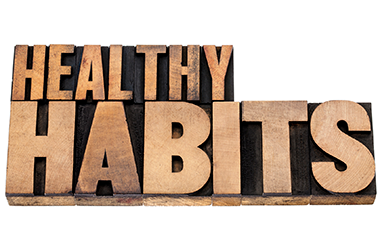 In this final part of our 3 part healthy habit mini series we are looking at 10 practical steps on how being intentional with behaviour change creates healthy habits. Being intentional to stop and think about the things that trigger certain behaviours is the first step in changing our habits - e.g. Why did I take the stairs instead of the lift, why did I have a salad instead of a pizza for dinner? Remember triggers can be caused by internal or external causes. Identifying if the trigger is a response from a genuine need such as hunger or thirst, or if it is in response to a psychological trigger such as boredom or loneliness can help us make a wise choice. Spot healthy and unhealthy patterns - e.g. Going to bed early or eating meals at the same time of day vs binge eating and drinking in front of the evening TV. Refer back to readiness to change - ask yourself honestly where you are with respect to the aspect of lifestyle you are thinking about changing. Be cause habits are part of a larger neurological pathway, identifying and re-purposing existing triggers means we can re-use existing wiring as a short cut to changing current habits - for example - putting the dried fruit and seeds where the sugar pot lives to replace the porridge topping, putting vitamins or medication alongside the toothbrush and toothpaste or putting suncream with the sunglasses, means that we are more likely to perform new behaviours using existing triggers. These new behaviours are even more likely to become habits by making it as difficult as possible to revert back to old behaviours, by doing things such as hiding the sugar in the back of the most awkward cupboard in the kitchen! This is an extension of the suggestion above - For example - avoid mindless snacking in the evening when we are bored by not buying the biscuits and snacks in the shop on the way home from work. They won’t be there to remind us of them in the evening and If we really still want the snacks we’ll have to go back out to the shop to buy them - which is often enough to resist! Start new healthy habits by putting triggers in a place where they can be easily noticed on a daily basis. To eat more fruit or practice the guitar the idea is to make the triggers as obvious and intrusive as possible, e.g. have fruit out on the counter or leave the guitar out on a stand next to the TV. Of course the reverse of this is also true; Not putting ourselves in the way of bad things by intentionally avoiding the places we know will lead us astray… Drive the long way home so we don’t have to go past the fast food restaurant, take only enough money for petrol so there’s no way to buy snacks and cigarettes at the petrol garage, leave the phone somewhere out of reach at the dinner table. At Intentional Health we remind ourselves that we are all on a unique journey. We emphasise focusing only on one step at a time and setting small measurable milestones rather than huge unobtainable goals. once we have started we have momentum on our side and are well on our way. This can apply to both starting new behaviours or ongoing habits, for example, in the morning focusing on getting out of bed and getting the gym clothes on is usually enough to initiate momentum. Once I’m up and dressed getting to the gym is relatively easy! And after a while, we don’t notice the different taste in taking no sugar in the tea. Being able to also regularly stop and take a step back helps us see our big picture. This helps remind us of; the progress we have made, the reason behind the change in the first place, why it might be important for us to succeed and where either the healthy or unhealthy habits are likely to take us in the long run. All of this combined can help us to make resilient and wise choices that are far less influenced by present circumstances and temptations, and also keeps up our motivation. Habits are comforting, so when we allow ourselves to feel bad with condemnation, we tend to revert to the things we are often trying to change! For example, when I slip up or relapse after I’ve told myself I won’t eat a biscuit today, I’ll feel bad and comfort eat the rest of the packet! Having a little more compassion for myself might have led me to instead to put the rest of the packet back in the cupboard and reminded myself that tomorrow is another day. After all, that’s what I’d tell my best friend!! Instead of comparing our successes and failure to that of others, remember that we are all unique and identify what it is specifically that makes me tick, wakes me in the morning or keeps me from sleeping at night. This will be far more helpful than comparing how good or lousy I am than others as I can then consider how to deal with the behaviours within my control. Find a buddy to be accountable with or an incentive to succeed to. Telling someone else ‘what’ we are trying to do and also ‘why’ it is important to succeed can really help with motivation. When we are having a tough day, we will have the added barrier or incentive to have to report back to a buddy about how we're getting on. Finding someone trustworthy and encouraging can act like an honest mirror. If facing consequences is an additional deterrent or motivation for healthy behaviour, we could use this an an option for our trusted accountable buddy immediately impacting ammunition to use against us! For example giving them undated signed cheques made out to a charity of my choice for more than I would normally give - along with an instruction for them to send it on my behalf if I don’t make the gym could be a compelling reason to get going! For more information around habits and behaviour change we suggest reading Charles Duhigg’s 'Power of Habit', or Gretchen Rubin's 'Better Than Before'. The content from these short posts are taken from our Intentional Health Programme. Please get in touch if you would like to find out more about joining one of these community programmes. Newer PostLooking for a miracle cure?